Team Matilda – kitted out in eye-catching King of Mountain gear – at the Muthill Sportive. 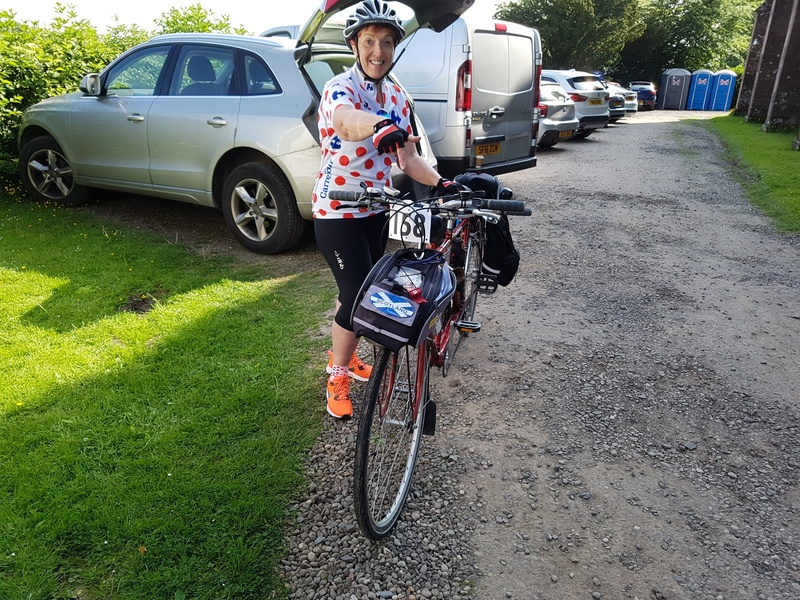 There was much excitement at Matildas Rest on a recent Saturday as it was a big day for this “old lady” – I was taking part in a real official competitive bike event – the Muthill Sportive 2018. This would only be my second ever Sportive and I was all geared up for the big event as the “old git” had told me that not only was I going to have an official participant number but that I was going to have a timing chip. Serious stuff! Those of you with good memories may remember my Sportive debut a year ago when the “old git’s” son Niall took up a role as substitute stoker as the “old gal” was working. Team Matilda hadn’t planned to be taking part this year as the date was scheduled to be the penultimate day of our Nutty Tandemers Club Hebridean Way Challenge. But sadly personal circumstances resulted in that adventure having to be postponed. So my dynamic crew decided on a last minute entry. 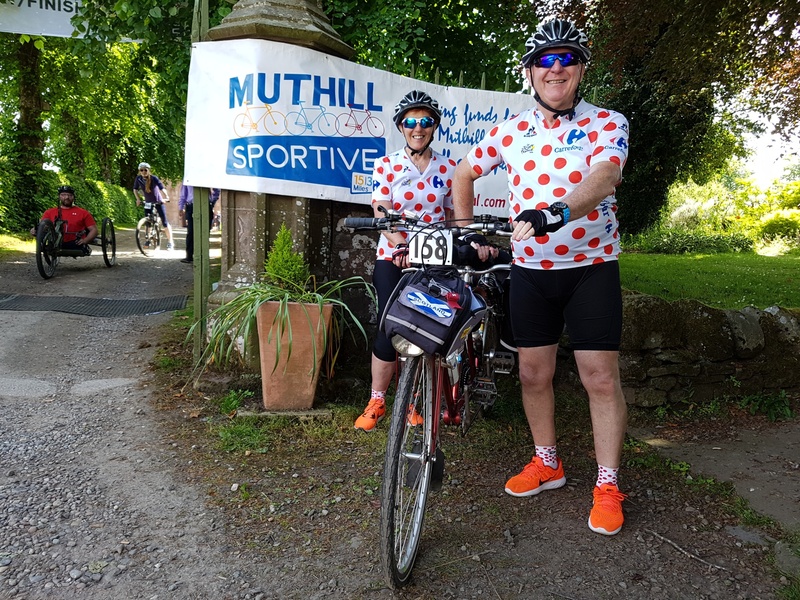 The Muthill cycling event has the reputation for being Scotland’s friendliest Sportive and that was immediately apparent from the warm welcome my crew received at the registration desk – which was basking in bright sunshine, in stark contrast to heavy rain of last year. 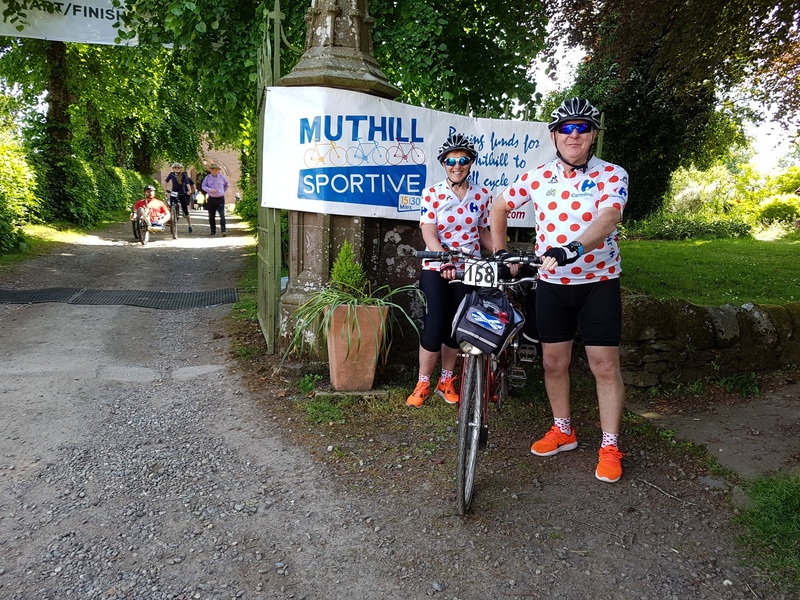 The idea of the Sportive is to raise funds for the Muthill to Crieff Cyclepath project which will create a safe route along the 4 miles to the Strath capital, avoiding the busy A822 road. Phase 1 of the project is complete – a 1 mile off-road route from Muthill to Templemill, which links with other core paths and quiet country walking and cycling friendly roads. Just over two years ago when it was opened, I was the first tandem to ride the new cycle path. You can read more about the project in my blog of that ride. Ready for the off- with my official ‘158’ sportive competitor number! Team Matilda was taking part in the Yellow Route – an 18 mile cycle around quiet local Strathearn roads. 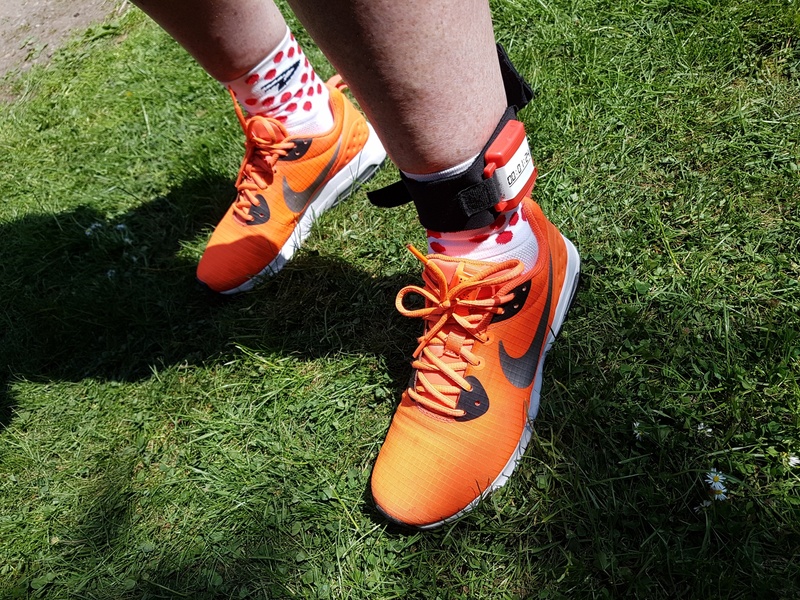 I had my start number of 158 firmly attached to my handlebars and the “old gal” volunteered to attach my snazzy timer chip to her ankle – even tho it did look like she was wearing an electronic monitoring tag! No comments about the “old gal” being used to wearing a tag! This is the official timing chip! Then it was time for the off and we lined up with just under 30 other bikes. I was proud to be the only tandem on the start line and I am glad to say I got quite a few “nice bike” and “special machine” compliments. A quick safety briefing, and the horn was blown and we were underway! At the start line – ready for the hooter! Check out the details of our route by clicking on the Strava map below. The “old git” and the “old gal” set off at good pace along Muthill’s main street before starting a long slow climb up past the local golf course. This turned out to be a bit of a “killer hill” so soon in the route – which is perhaps no surprise as a later check measured the incline at 10.3%. I think the joke turned out to be on my dynamic crew who thought that wearing their King of the Mountain cycling shirts would be a big joke! But after a bit of a push (literally!) we reached the plateau and then the rest of the ride was much more enjoyable and we soon picked up speed again. The ride was well signposted with big yellow arrows marking directions at every possible junction to ensure we couldn’t get lost – and there were marshalls at any intersections with busier roads. The route developed into a gently undulating ride, along well maintained farm roads before briefly emerging on to the Crieff to Braco road for a short section, turning into another maze of farm roads. We crossed the Auchterarder to Crieff road before the route took us along the roads around Tullibardine and then along in front of Strathallan Airfield. Tantalisinly there were signs for Muthill but we were directed away from the direct road for another loop round country roads – just as my crew were starting to feel their fuel tanks getting low on energy. Fortunately there was a nice downhill stretch before the last section which made use of the completed first section of the Muthill to Crieff cycle path. Only difficulty was that this was uphill creating a Tour de France-style finish at the top of a climb! Well almost … but obviously just a tad less steep! 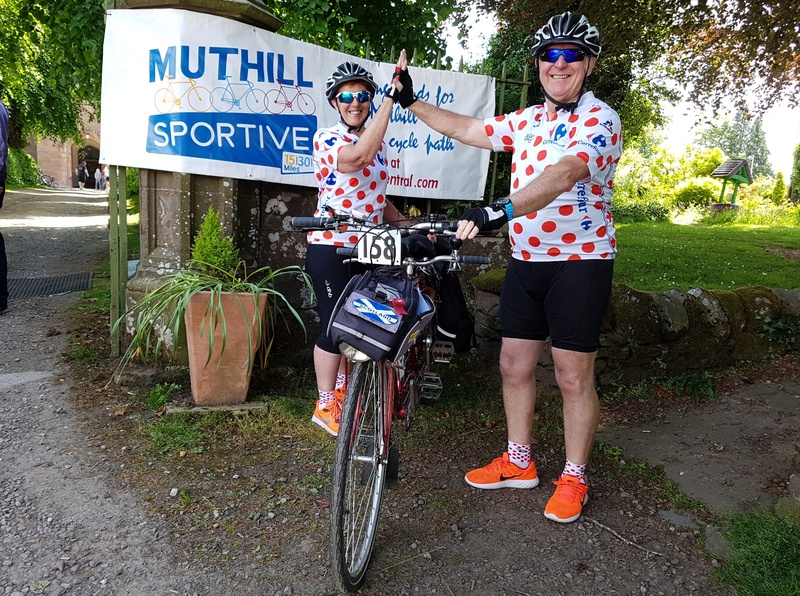 As we turned into Muthill church yard Team Matilda had that euphoric feeling of knowing they had actually completed a sportive as they crossed the finishing line. A quick glance at the electronic timer clock revealed that we had finished in a fairly respectable time of just under 1 hour 31 minutes. Hi-fives at the end – the “old git” and “old gal” happy at the end! The friendly nature of the Muthill Sportive was underlined by the amazing hospitality on offer back in the church hall. An army of volunteers had been busy and yummy home made soup was on offer, along with tasty filled rolls, followed by a fantastic selection of home baked cakes. The fact that they even had gluten free cakes was quite literally the icing on the … well you know what I mean! So after some much needed re-fuelling it was time to head back to Matildas Rest where the “old git” checked Strava which officially recorded the ride as being worthy of no less than 15 gongs – 5 personal bests; 8 second bests; and 2 third bests. Amazingly Strava also gave my dynamic crew another 3rd best ever gong – meaning that our time of 6 mins 49 secs is now down in history as the 3rd fastest time ever recorded on the 2.3 mile section ‘Machanay Road only’. Well to be totally honest, it was the 3rd fastest time ever recorded by a female as I am officially registered as a female by Strava – but a gong is a gong! And there was also an 9th best ever time too! Phew – quite a day! The detailed Strava figures showed my dynamic crew tandemed a distance of 18.3 miles with a moving time of 1 hour 31 minutes. The average speed was a healthy 12.1 mph given the hilly terrain while the elevation was 1036 feet. The maximum speed was 31.3 mph and Team Matilda managed to burn up 1229 calories and produce an average power output of 202 W.
As always the route is brought to life in our Relive 3D video – so take a look below. My dynamic crew both agreed that The Muthill Sportive was a great event and fun to be part of! Apart from living up to its reputation of being one of Scotland’s friendliest sportives, it certainly offered a great opportunity to promote cycling and the benefits of off-road cycle paths in the beautiful Perth and Kinross Countryside Trust and Perth and Kinross Council area near Perth City Centre. Lets hope the event raised lots of money for the Muthill to Crieff Cyclepath project and that I will soon be blogging about new developments and an extension to the existing first stage of the route – including a large span bridge to cross the River Earn at Crieff. Team Matilda is certainly planning on being on the starting line next year! 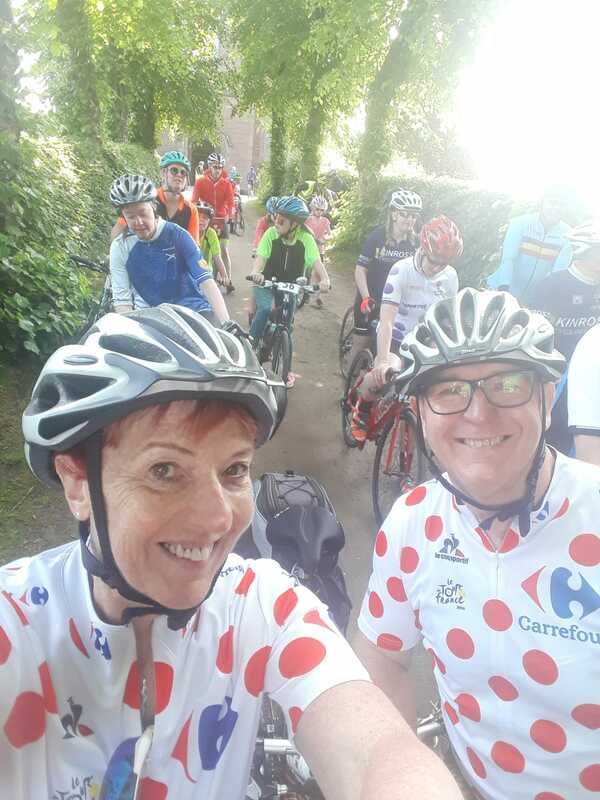 Team Matilda are already planning to join Scotland’s friendliest sportive in 2019! ← Tandem ride to festival that leaves you wanting Mhor! Well done Matilda, a jolly good description of your Sportive. Does it raise money with entrance fees or do you get sponsorship?